Sold in March 2016, the 29.5 metre motor yacht Sovereign is back on the market, listed for sale by Bob O’Brien at IYC in Palm Beach. Built in aluminium by US yard Burger Boat to a design by Jack Hargrave, she was delivered in 1966 and has been upgraded many times since, including a new bow thruster in 2015. Previously named Elizabeth R, her interior in teak and burl wood paneling accommodates up to eight guests in four generous cabins consisting of a full-beam master suite, two twins and a single cabin with a Pullman berth, all with en-suite bathroom facilities. 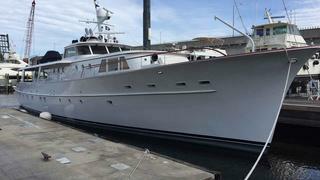 In addition, there are quarters for four crew in three cabins aboard this yacht for sale. Her large saloon has a lounge area with comfortable seating and an entertainment centre including a large television screen, while forward is a formal dining area with seating for eight guests, and she features walkaround side teak decks. The aft deck has built-in upholstered seating and a twin pedestal large varnished teak table, lending a gracious air to al fresco entertaining and dining. Up on the boat deck is more outdoor relaxation space, offering four varnished teak chairs and a table, along with two six-person Zodiac life rafts. For truly dedicated sun lovers, there is seating on the foredeck, offering complete privacy at sea and when moored in port. Lying in Fort Lauderdale, Florida, Sovereign is asking $1,474,000.